Solgar® Gold Specifics Homocysteine Modulators with Vitamins B6, B12 and folic acid is one of Solgar® Gold Specifics premium-quality formulas. 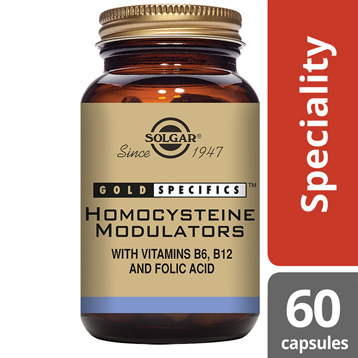 Homocysteine is an amino acid created in the body during metabolic processes instead of being consumed in food. 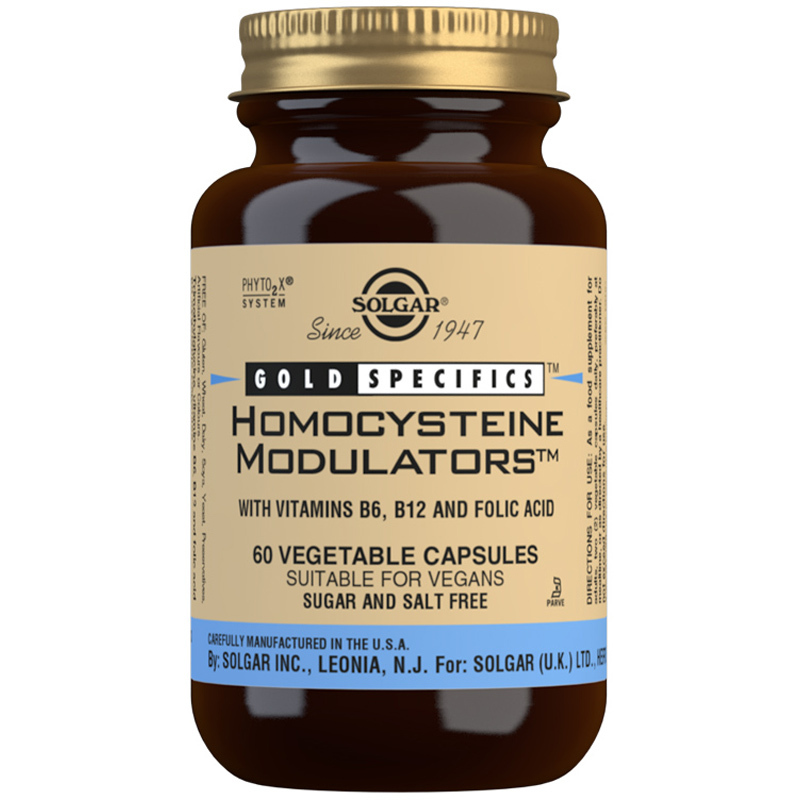 Homocysteine needs to remain on a balanced level, with normal homocysteine metabolism, an important factor in heart health. Ingredients: Trimethylglycine, Vegetable Capsule Shell: hydroxypropylmethyl cellulose, Anti-caking Agents: (vegetable stearic acid, vegetable magnesium stearate), Bulking Agents: (mannitol, microcrystalline cellulose), Vitamin B6, Pyridoxine HCI, Pyridoxal-5'-phosphate, Vitamin B12 (as cyanocobalamin), Antioxidant (powdered blend of L-Ascorbic acid and beta-carotene), Folic Acid (as pteroylmonoglutamic acid). As a food supplement for adults, two (2) Vegicaps daily, preferably at mealtime, or as directed by a healthcare practitioner.